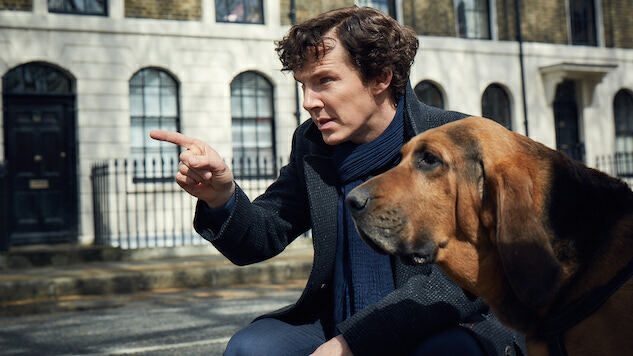 From Arthur Conan Doyle to Benedict Cumberbatch, What's the Essence of Sherlock Holmes? January 1 saw the return of the world’s most popular drama, Sherlock, to screens everywhere. The happy return is appropriate, for 2017 is the 130th anniversary of the first Sherlock Holmes story, “A Study in Scarlet.” Why are we still watching and reading about this world? More to the point, why do I care about Sherlock Holmes and Dr. Watson—two gentlemen who are as real to me as Congress, but less involved in crime? Why do I love them enough to write a feature about them? Not just the show, but the characters themselves? And here the trouble begins. I re-read that opening sentence, and it sounds as if it could be in any generic feature about Doyle’s fictional detective. The problem with writing about Holmes is the same with writing about the sea, or the moon, or the appeal of a lover: You have so much to say, and there are so many ways of saying it, that it’s hard to concentrate on one thread of argument. Every sentence, every turn of phrase, brings up some part of the Sherlockian canon. The writer is forced to fight a constant battle against his or her own predilection to give into the quoting fever and go on a drunk citation binge. There have been countless adaptations of the Great Detective. When I use the word “countless,” I’m not just using the word glibly (unlike all of the other times). I mean, literally, nobody has counted them. The published, cataloged pastiches range in the thousands. The unpublished and forgotten may be many times that. Even within Sherlock Holmes fandom, there are levels of maniacal obsession; I am pleased to be among the first rank of the congenitally rabid. Like any immortal story, the outline is bare enough that a politician could sing it to his mistress while fumbling for a key. A simple seed: damaged goods from the Afghan War seeks acceptable lodging with eccentric student. Here are two people. This one writes, this one thinks. Both fight. But also, like all great legends, from a bare outline there comes a great harvest: Watson and Holmes, co-drawn into one another’s orbit, giant moons in a tidal pull of mutual gravity. Much of what makes the original Holmes stories work lies in Doyle’s prose, which is consistently underrated: The man’s writing has a strong, singular elemental effect behind it, a union of sure-footed heroism joined to a kind of wonderful intellectual engagement, and this result is doubled when it plays out in the half-urban, half-Gothic, all-wonderful demimonde of the original stories. Doyle’s art was of a diligent man writing a character he was not reverent of, and he placed him where he liked, whereas even our best writers today take Holmes and his world seriously. The Great Detective is a consulting ratiocinator—not an office of the law, no matter how much the Metropolitan Police may treat him as an appendix, or vice versa. Behind the intellectual fireworks are deep-engraved statements of life, the street, and logic which are so pitch-perfect I hesitate to use the word “pulp.” Holmes is not the cozy mysteries of Marple, or the locked room or ghostly house of the early 20th century. Doyle’s shadowy London inspired the hardboiled arias of Chandler, Spillane, and Hammett. Doyle was no slouch when it came to portraying the odds and ends of what he called the “cesspool of the Empire.” Sir Arthur’s depictions of fin-de-siècle London are more striking and more outré than many other recorders of that time, who wrote with more frankness but less wisdom. And of course, clue after clue, well-balanced by the secret heart of the Holmes world, the same interest that returns us time and again to 221B Baker Street: the relationship, the brotherhood between Holmes and Watson, and the compelling, memorable world circling around them: Mrs. Hudson, Lestrade, the Irregulars, and the specter of Imperial London itself, rising misty and marvelous from every street corner. But why? There have been so many adaptations. To put it another way: How far out does Sherlockiana go? Will anyone in a deerstalker do? In other words, I want to know what is essential to Holmes. To reverse-engineer a complicated machine, you take away parts until you find the bare minimum. To understand how a car works, the engineer would remove all extraneous goods until she came to the engine and wheels. You take away the parts until the device stops working, and then you learn what the essence is. To put it another way: There have been lots of my beloved Holmes. What makes him him across the mediums and years? What ties Jeremy Brett (The Adventures of Sherlock Homes), Benedict Cumberbatch (Sherlock), and Meredith Henderson (The Adventures of Shirley Holmes), and Barrie Ingham (The Great Mouse Detective)? What matters is not the incidentals but the essentials. As a Sherlockian, it doesn’t matter if the Detective is white, black, male, female, British, American, polite, rude, straight, gay. The Detective is best thought of as an equation. Constants and variables. Holmes is a person of no determinate age, not old but not too young. Hawk nose and forehead preferred, not required. Comes from money, but not too much: a fortune large enough to explain his habits, but small enough to where his name alone wouldn’t matter in the land. Artistic, dramatic, bored easily. Otherworldly about him. Not alien, but different. Addictive, maybe. Usually single but never alone. Stronger than he looks. Bohemian in his habits. There’s always a best friend. A brother. A professor he opposes and defeats. But these are still surface matters, and may be dispatched with. What cannot be removed from the character? Here is what is absolutely essential: Intelligence and eccentricity turned all the way up. Some geniuses aren’t eccentric (Solomon the Wise) and eccentrics aren’t necessarily smart (Kramer). Holmes is both, but with a difference. Intelligent eccentrics are often oblivious (Emmett Brown) or unworldly (Sheldon Cooper). He doesn’t have to be Bohemian, but he must be very different. Holmes is unusual because he is not just able to survive, but also to hunt criminals in their element; his worldliness is also turned up all the way. Sheldon doesn’t get people and Brown can’t be bothered, but Holmes has to be; he is an expert in moving within the world. He is physically capable in a way other fictional smart guys aren’t. What separates him from Batman, then, besides the obvious? Holmes is open, or honest, call it pro-social if you want. He is almost compulsively discursive about himself and his methods. Intelligent, eccentric, worldly and open, all turned to 11. These are the sine qua non of Holmes. But there’s one thing missing, an element that does not belong to Holmes himself, and yet must be part of any Holmesian universe: The best friend with military connections that he has a superhuman bond with. Without Watson, it’s not Holmes. The two Doyle stories written from Holmes’ perspective? Dull as a murderless street. No Watson, no Holmes. The tale of Holmes, the studies in scarlet and final bows, are the story of this remarkable friendship between two equals. The difference between a shallow and a deep reading of the Sherlockian canon is the understanding that the world of Holmes is a two-man show. So: Smart, weird, canny, open, Watson. With these five, you have Holmes. Without, you have the problem of an empty House. I can believe Hugh Laurie as American Sherlock for one season, or two. But it stretches credulity that even a maximally insufferable ersatz Holmes would be so dishonest and so oblivious to his own weakness. Holmes can be self-destructive, but not continually perverse. He can lie to Watson briefly, but is constitutionally unable to do so at any length. Crime is common and logic rare. In middle of that scale stands the Detective—for my money, the only True Detective; endlessly complex, yet, at the bottom of his very human heart, surprisingly elementary after all. Jason Rhode lives and keep bees upon the South Downs. If you ever find him giving less pains to a feature than it deserves, kindly whisper “Norbury” in his ear, and he shall be infinitely obliged to you. You can also follow him on Twitter.